If there’s ever been a month so far where the stereotype of Seattle weather was also the reality, it would be March. An exciting day occurs when blue skies peek through for an hour or so midday. Back in the summer and fall I thought the rainy Seattle stereotype was an exaggeration told to keep so many people from moving here…but I was wrong. Silly transplant, it just wasn’t rainy season yet. So with grey skies as common as bad traffic on 405 (apparently we’re fourth worst traffic in the nation), I need a little sunshine in my days and I find myself opting for brighter, sunny shades of vegetables: sweet potatoes, red potatoes, golden beets, and bell peppers. Brightly colored vegetables aren’t just good for improving your mood when it’s raining again for what feels like the 15th day in a row; colorful vegetables also provide an impressive nutritional punch and a tantalizing amount of flavor. One of the best pieces of nutritional advice I learned during my coaching certification: the more colors you eat (natural colors, of course), the less likely you are to get injured. It’s not 100% true (plenty of runners who do everything right get injured), but it’s a good place to start. As always, I’m a bit behind on the trends, even though I spent far too much time on Pinterest. Most days I throw a ton of vegetables and grains into a bowl all the time without realizing until recently that these nutritionally dense and tasty bowls had a name: buddha bowls. What’s a buddha bowl, you ask? (Don’t worry, I had to google the term also). They’re bowls so stuffed with nutritional foods like vegetables, grains, and plant-based protein that they resemble the round belly of a buddha statue. Sure, I can see the resemblance, but I also think the name stuck because of the catchiness—the English major in me has always love alliteration. They also appear under the moniker of power bowl or grain bowl. Whatever you call them, these bowls are nutritious and generously portioned meals comprising of a grain, a protein (often meatless), plenty of vegetables, and healthy fats in the forms of nuts, seeds, or sauces. In terms of sustainable eating, the buddha bowl wins. It’s a hearty and satisfying meatless option for even the biggest of appetites. Plus, buddha bowls are a runner’s dream: carbs and healthy fats plus the satisfaction of a high-volume meal. Because we all know that running gives us big appetites. So, this sweet potato brown rice bowl I shared over the summer is a buddha bowl of sorts, minus a delicious sauce and without a lot of creativity. 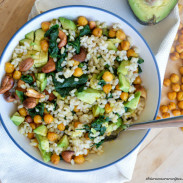 The curried beans and greens bowl recipe is also an example of a buddha bowl, with roasted chickpeas, brown rice, spinach, cashews, and avocado. Those bowls, however tasty they are, are no match for this savory, smoky, and hearty roasted root and quinoa buddha bowl. Garnet sweet potatoes (yams): These dark red/orange sweet potatoes are packed with fiber, vitamin C, vitamin B6, potassium, and maganese. Golden beets: These sweet tasting vegetables serve up fiber, potassium, vitamin C, and calcium. Unlike red beets, they don’t have the (ahem) side effects of beeturia. Quinoa: This pseudograin contains fiber, protein, folate, magnesium, phosophorus, iron, zinc, and maganese. Pumpkin seeds: In addition to adding a satisfying crunch, pumpkin seeds (pepitas) provide unsaturated fats, fiber, protein, iron, magnesium, zinc, and copper. Tahini: Tahini is packed with healthy fat (including some omega-3s) for creamy, satisfying sauce. 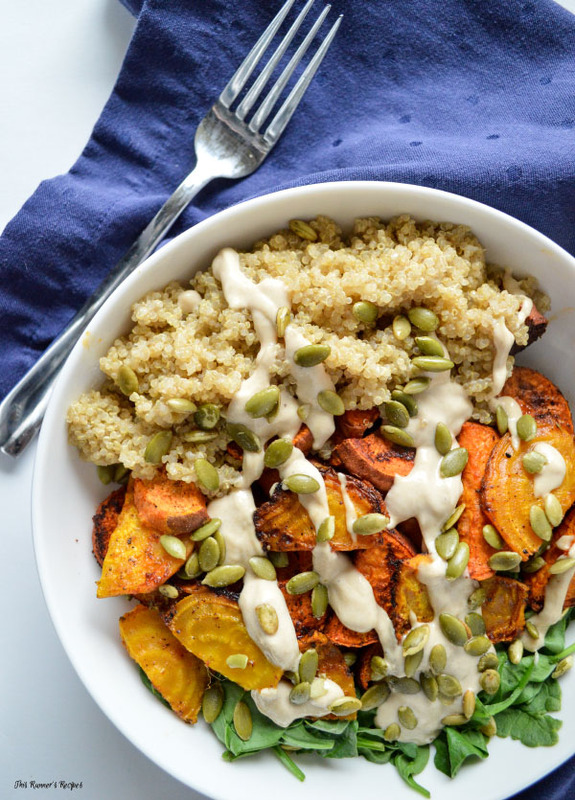 As you can see, this roasted root and quinoa buddha bowl is brimming with all of the nutrients runners need: carbs, protein, healthy fats, iron, and magnesium. Nutrients aren’t all that matters though; while they are essential, you also want your food to taste good. I’ve had this bowl for lunch that past two days already, so I promise you that it tastes so good that once you finish you’ll already be planning when you can make it again. Buddha bowls are also the hungry runner’s best friend during busy weeks, because you can prep everything in large batches ahead of time, store in your fridge, and portion out each day when you pack your lunch or make dinner. 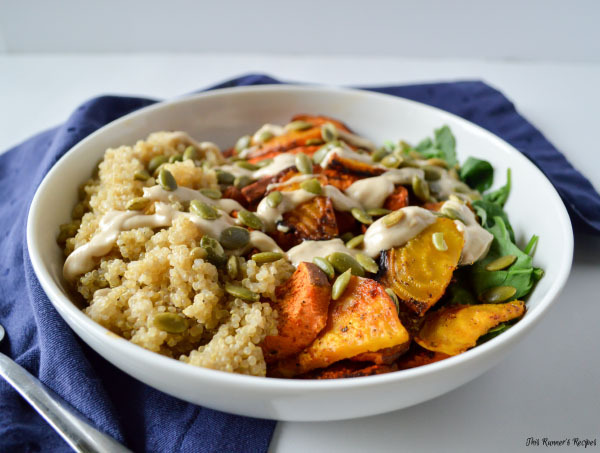 This roasted root and quinoa buddha bowl is very simple to make: you cook up the quinoa (this guide will help you make perfect quinoa every time), roast the sweet potatoes and beets, whisk together the sauce (which takes all of 30 seconds), toss it over some spinach, and garnish with some roasted pumpkin seeds. It’s so easy that I question whether it should actually be called a recipe, but it’s so delicious that I just have to share this with you. Of course, you can season the sweet potatoes and golden beets however you desire, but my current favorite combination is Greek seasoning and smoked paprika for a Mediterranean flavor. The lemon tahini sauce is a perfect complement to the spicier flavors. Chop the sweet potatoes and beets into small pieces. Toss with the melted coconut oil, Greek seasoning, paprika, and sea salt. Place on a baking sheet lined with parchment paper and roast for 45 minutes. Toss halfway through to ensure even cooking. With 25 minutes left to go on the vegetables, bring the quinoa and stock to a boil. Once it reaches a boil, reduce the heat to medium low and cover. Cook the quinoa for 15-20 minutes or until all of the water is absorbed. Remove from heat and fluff with a fork. In a small bowl, whisk together the tahini, lemon juice, salt, pepper, and garlic powder until it forms a thick sauce. Place the spinach in a bowl (wilted if desired) and top with the vegetables and quinoa. Drizzle the tahini sauce on top and garnish with the roasted pumpkin seeds. *To make your own, combine equal parts salt, pepper, garlic powder, basil, Greek oregano, rosemary, dill, and thyme for a similar blend. Granted, I’m downright obsessed with Mediterranean food. Along with Mexican food, it’s my favorite cuisine to choose for when we eat out. You can never go wrong huge plate of shawarma with pita and hummus (well, you probably don’t want to eat it before a run…). And likewise, you just can’t go wrong with a huge bowl of veggies and protein like this roasted root and quinoa buddha bowl. 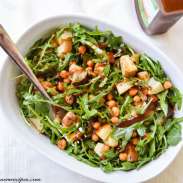 Linking up with Foodie Friday and Meatless Monday. Do you often feel behind on trends? Do you find yourself changing what you eat based on the weather? my kind of meal! I love bowls like this and recently decided I need to buy tahini and use it at home. my dinners always look like some sort of Buddha bowl ( I usually refer to it as a power bowl). so delicious and easy to customize without planning too much in advance. I thought you would like it! You really should buy tahini, it’s so good on bowls. Ryan and I both eat it almost everyday. And I love the no need to plan for these bowls – whatever is on hand! LOVE LOVE LOVE roasted root veggies- this looks amazing! Thank you! 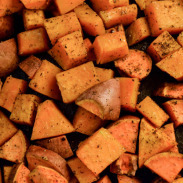 Love roasted root veggies also – and they’re available year round so it’s a win-win! This looks so good! I love the combination of flavors! Thank you! The combo of flavors is my favorite part also – spicy and lemon-y! NEED this. Need it. YUM. Making this for Alex and me! You need to try that Greek restaurant! And then try Lebanese style Mediterranean like shawarma, which is so good out or super easy to make a home, especially if you have tahini 🙂 Oh gosh and now I’m so hungry for pita and hummus! Loving this Buddha bowl! My tummy is always well rounded after eating bowls too, but so many recipes look delicious and turn out to have my allergens in them (wheat, avocado, and tree nuts are all no-nos) so I can’t wait to try out this combination! This looks delicious! We’re all about the Buddha bowls in our household. Thank you! They’re such a healthy and easy meal – gotta love them! I love making Buddha bowls! Although usually I just call it – Every thing but the kitchen sink bowls. All of my favorites in one spot? Pure tummy bliss! Yes pure tummy happiness! And it’s so easy just to toss whatever’s in the fridge in – endless options = never getting bored! YAY another tahini recipe! I love the combo you’ve made here – those roasted sweet potatoes and beets with that tahini dressing look irresistible! You can’t beat it! I had it for lunch like every day last week … yum! Thank you! You should make it and let me know how it goes 🙂 It’s such a great prep-ahead meal! Oh, I TOTALLY feel behind on trends! Just last week or the week before, I made my FIRST homemade nut butter, ha! 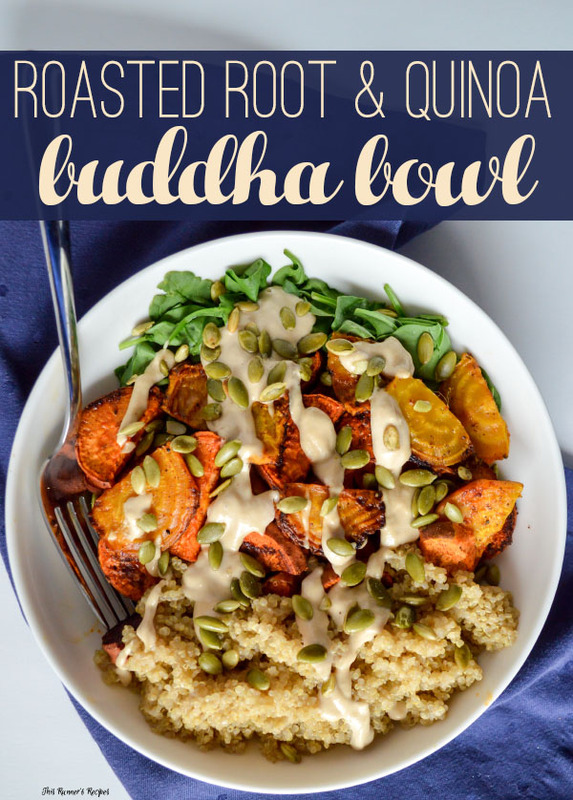 I love roasted root veggies, and combined into one hearty buddha bowl? You got me! Oh it’s been forever since I’ve made nut butter! It’s never to late to start on these trends, especially when it’s tasty food!